Home Smartphones Telecoms Samsung Galaxy S6 in Blue Topaz now exclusively available with Smart Postpaid! 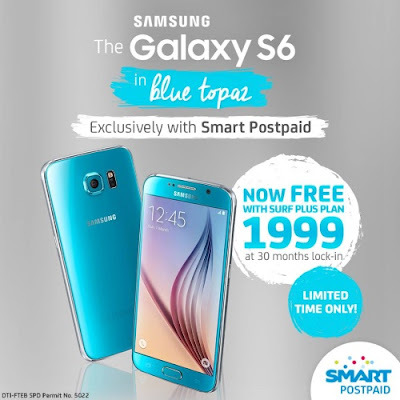 Samsung Galaxy S6 in Blue Topaz now exclusively available with Smart Postpaid! Smart recently announced that the Blue Topaz variant of the Samsung Galaxy S6 is now exclusively available in Smart Stores nationwide, and subscribers can also enjoy it for FREE, with one of the postpaid data plans from Smart. Now available for a limited time through Smart’s Surf Plus Plan 1999, the Samsung Galaxy S6 in Blue Topaz will definitely add a touch of color to your everyday life. And with unbeatable inclusions from Smart powered by its largest and most advanced network, you’ll get to enjoy all the online activities you love the most anytime, anywhere! “With supersized mobile Internet inclusions, a new Blue Topaz variant, plus a more affordable price point at only P1,999 a month, there’s no denying that subscribers can definitely get the best Samsung Galaxy S6 data plans only from Smart,” said Kathryn Carag, Postpaid Marketing Head at Smart. Access to these freebie apps will not be counted against their monthly data volume allowance, or until they reach the allocated data volume per app. So why wait any longer? Get your very own Blue Topaz Samsung Galaxy S6 for FREE at Smart Surf Plus Plan 1999, available in all Smart Stores nationwide for a limited time only. You may also check out the Samsung Galaxy S6 edge, which is also available at Plan 1999 with a one-time cash-out of only P5,500. Both offers are available from Smart Postpaid with a 30-month contract.